Anti slip caters for one of the key aspects of industrial flooring, but one that is often overlooked in favour of other features like colour or chemical resistance. With the right resin flooring, you don’t have to compromise on grip under foot – anti slip surfaces can offer all of the benefits of resin, but with the addition of an aggregate to texturise the floor and reduce the risk of slipping. This is particularly beneficial in locations where the surface is likely to be wet on a regular basis, such as outdoors or in wet rooms, and it can also provide an extra degree of protection against slipping on a chemical or oil spill. Anti slip surfaces are not just for areas with heavy pedestrian foot traffic – it can also be beneficial on surfaces where vehicles pass over regularly. For example, anti slip around vehicle entrances to indoor areas can give extra traction when coming in from the rain, as well as extra grip on slopes to make sure vehicles can make the climb. Allow employees to walk confidently for maximum productivity. Protect against slips in wet conditions or during a fluid spill. Meet all relevant health and safety requirements. Provide extra grip on slopes, steps and stairs. 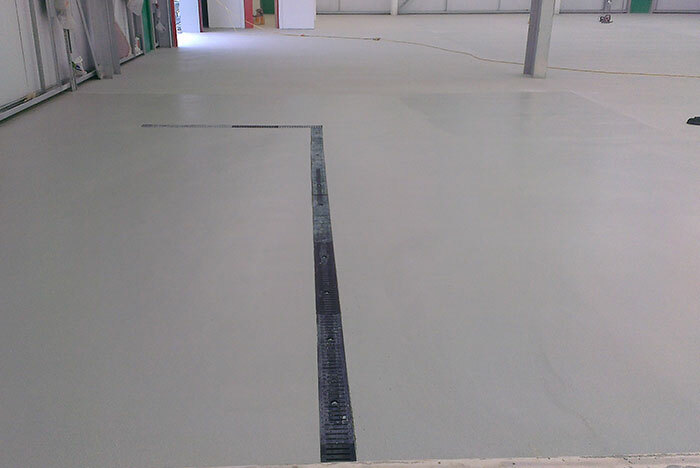 We can install anti slip flooring as part of a typical resin flooring installation – it does not reduce the options for other features like chemical resistance and extra hygienic surfaces. Anti slip floors can still have a primer layer underneath for extra protection against damp or oil spills, and we can install textured resin for extra grip on slopes and ramps too, for example between the different levels of a multistorey car park. If you have an existing floor surface that is too slippery, we can advise on adding a textured layer on top using a mixture of epoxy and aggregate, or whether a completely new high grip surface would be the best option.